Does your dog jump on people when they approach? Does he bark all the time when the bell rings, or to other people and/or dogs with no apparent reason? Does he destroy furniture, doors, couches, …? We help you to identify the cause of those problems (that can be just behavioural, or it can have a physical, emotional and/or social origin), and we work to solve it. At CANMIGOS we work the dog behaviour problems with training in a unique way that will let you enjoy 3 special benefits. Two dog trainers will visit you during the first evaluation session. During this first meeting we will ask, observe and record (in video), in order to get all the available data about the starting point for the dog training work process. Next we will send you our proposal of the detailed working plan, with an estimation about the cost and time needed. 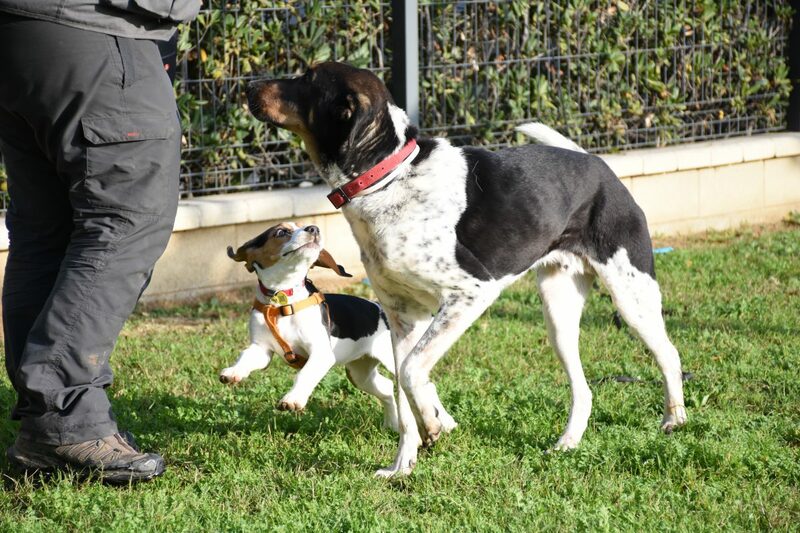 And then we will start working: our dog training model offers an intensive working process in which our dog trainer works 3 times a week with the dog. He is the professional and the one who has the knowledge and experience, and that is why we do it this way. By using this dog training system you will observe improvements in the dog in a more consistent and quicker manner. This way we can work the different dog training cases in less time: problems that could last 4-5 months working with sessions on a weekly basis can be reduced to 1 month. Do you want results now? We cannot guarantee them now, but sooner. During the 3 weekly dog training sessions the dog trainer works intensively with the dog. You as the dog’s guide do not have to be there if you cannot or if you do not want to. Of course, if you are, your presence and involvement will be positive in the next training steps for the consistency of the results, as it will be detailed next. If you are not present during the 3 training sessions during the week, we do a 4th session, the transfer session, when we show you the progress that has been made and we show you what to do and how to handle your dog in order to sustain those results in a consistent way. Here we will ask you for your full implication and time: the 3 dog training working sessions of the week are made for the dog-dog trainer work, and the 4th one (transfer session), if you do not participate in the previous 3, is made for you to practice and be updated. In order to finish the dog training successfully, that minimum implication from your side is needed, and not mandatory in every session. Plus, we do the dog training at your home/park/neighbour, where the dog usually lives and has the issue(s) to be solved. Please note that as soon as we adapt our training to each particular case, it can happen that the frequency of the sessions or the family guides implication are required to be slightly different to the one detailed above, which are the most common ones used in our dog training processes. The last scientific discoveries in the dog’s world give a complete new dimension to dog training, making possible to profit the animal’s maximum potential in his 4 dimensions: physical, cognitive-behavioural, emotional and social. Those are the basis for the cognitive-emotional positive dog training that we work with at CANMIGOS and we use to solve the behaviour problems. • A dog with anxiety when he is left home alone.